My second book “Vegan Richa’s Everyday Kitchen” is released in SEPT 2017!! Woohoo!. Get an exclusive set of recipes and exclusive videos in the Bonus Bundle here. Scroll below for more International Retailer links. 140+ Recipes. Many with variations to use different sauce or ingredient to make a new dish. 132 Gluten-free or Option Recipes. 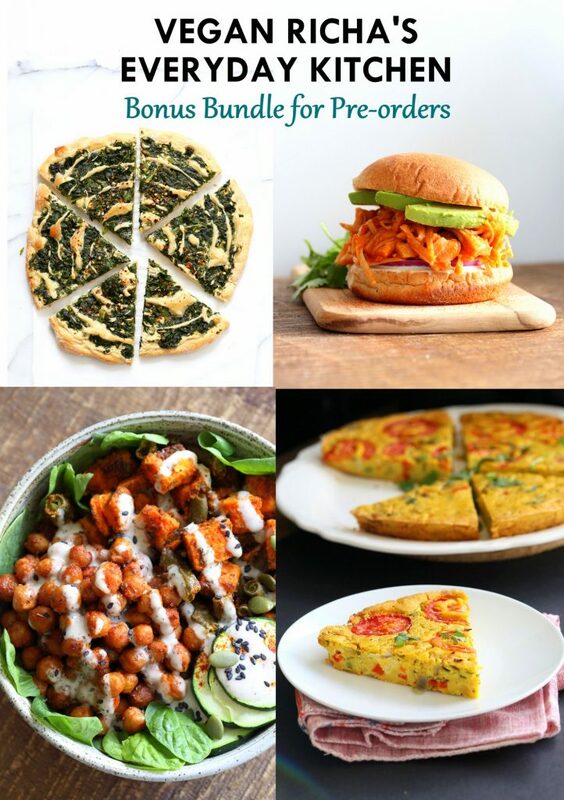 124 Soy-free or option Recipes. 107 Nut-free or option Recipes. There are corresponding recipes for some recipes such as a peanut sauce has a peanut-free sauce as a separate recipe and other corresponding gluten-free options. Making meals everyday, that are wholesome, delicious, fun to make and fun to eat is a hard task. If you want to put out the most amazing vegan food, that tastes good every single time! ; then you need this book. I follow simple rules when I am developing recipes for my blog. I strongly believe that Vegan food should be easy to make, taste good and be inclusive. This means I have a lot of allergy friendly variations and they taste equally good. I am Indian by birth, I love the complex flavors and the use of whole foods in the cuisine. My recipes often reflect this preference. This book expands on that philosophy with many different cuisines, a variety of flavors and easy to make everyday recipes. Many of you also frequently request the blog recipes in print form. So in this book, there are a number of blog recipes that are popular, tried, and loved. Also, More than half the recipes in the book are all New Recipes exclusively created for this book. There are 8 Chapters of Meals (Asian, Thai, Burgers, Pizza, Bowls, Curries, Burgers, Casseroles!)! 1 huge chapter on Desserts, and Chapters on Sauces and Basics, diy. People both new and familiar with my work find my recipes satisfying and flavorful. They often comment that the meal they prepared was loved by everyone, non-vegan members of their household and kids included and they are amazed by how easy it was to make. Many of the readers also frequently request the blog recipes in print form. So in this book, there are a number of blog recipes that are popular, tried, and loved. Also, More than half the recipes in the book are all New recipes exclusively created for this book. Read/Write Reviews on Amazon or GoodReads. Book Depository: Ships to many countries worldwide! Book Reviews, and Blog Tour: T.O.F.U Magazine review. For Giveaways and Events, see here. What the Recipe testers are saying..
“Your food is just really well seasoned. So many vegan books are bland, and yours pop with flavor. Even something seemingly simple like your ranch dressing is just better than other ones I’ve tried. Where other veggie burger recipes just seem so trite, you have managed to make that genre new again. With your recipes, the sum is greater than the parts, and you seem to have figured out this kitchen alchemy where everything just comes together beautifully”. This mailing list is different from the blog feed list and will be sent out infrequently, not more than twice a month close to release date. I am creating this list to make sure you don’t miss out on important updates and links about this book! Sign up below. 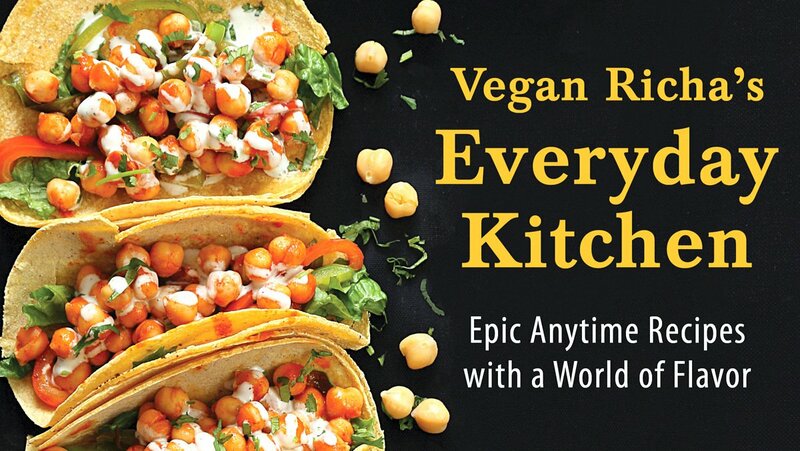 Subscribe below to Vegan Richa’s Everyday Kitchen Cookbook mailing list. It is 2 step process. Once you submit the form below, you will receive an email to confirm your subscription. Please click “Yes, Subscribe me to this list” button in that email to confirm. Thanks Sweta! Lots of works to be done in the next few months for the book! Waiting for the book. Will it be available on Amazon India? I will be posting links on this page, for all major international book stores once the book is in the distribution system. Thank you Julie! I am super excited too! I just updated the Pre order links!! I’ve just discovered you have a new book in the works and I’m so excited! Your recipes are some of my favourite ever! Thanks Richa ! Thank you Claudia! I just updated the Pre order links on the page!! Pre-ordered! Can’t wait. Love your site and all your recipes. So many favorites. I hope the deep dish pizza is in it! I just wanted to say thank you for sharing your recipes. I love your first book and and am looking forward to your second. I came to veganism late, I am in my fifties, I just love the flavours you use. Thank you. Hi Richa – I love your vegan recipes, the colours, tastes, textures, smells, ingredients – they are “simply the best”. Using that musical kind of analogy, your recipes all show a great beat, have good bass lines, great rhythm guitar sections and improvisations through neat lead guitar melodies. If you were putting together an album of Vegan Richa’s “greatest hits” Volume 1, which “top 10” of your many wonderful and delicious vegan recipes would you want to include in that album, so that someone unfamiliar with your work would want to say “wow, that was so good, I’ll have to go back and look at Richa’s ‘back catalogue’ “? Keep up the great work! xoxoxo It is fabulous! I’ve been working on it for almost 1.5 years now. it better be :). Thank you for Pre-ordering!! I just got the book Yesterday. The recipes look amazing. Now it is time for Richa’s amazing vegan dishes here in Australia. Congratulations on another amazing cookbook! You should be very proud of yourself and your work! You are a true artist! 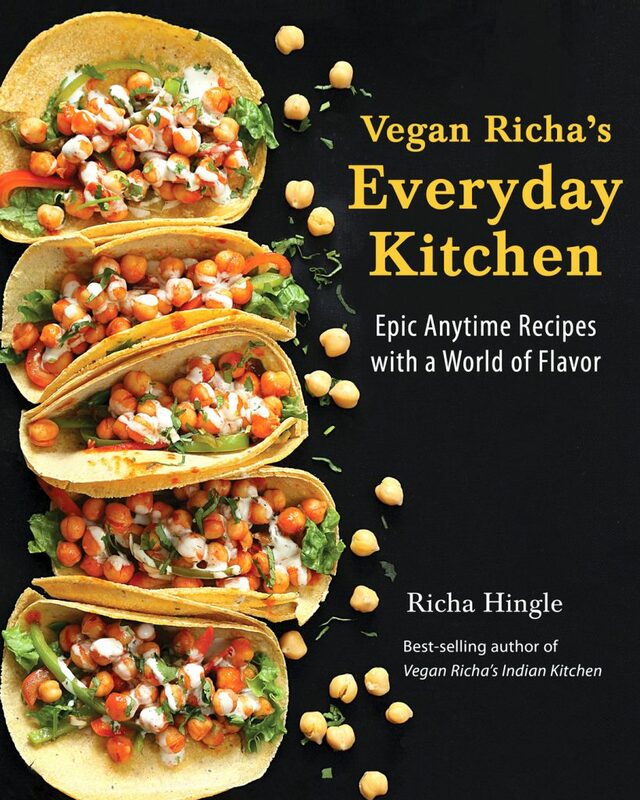 Hi Richa, congrats on this amazing new cookbook! Do you know if there will be a German translation for Everyday Kitchen? The translation of your first cookbook was really great and I’d love more of my friends (with language barriers) check out your awesome recipes. Lots of love from Berlin, you rock! Yes, there will be a German translation. The rights were given before the book even released. The translation takes a while however and new design and editing. So i dont know when it will be out. Why dont you ship your book in india?? If you ship then from which site we can purchase? ?